As part of the “MountEE” project, the “Sustainable:Building in the Municipality” service package (see link ) is to be expanded by a Module 5, “Service and Maintenance”. An offer is also to be made concerning the evaluation of energy consumption alongside the consultation in the area of environmentally friendly cleaning. The Client or the Building Operator will jointly decide on the basis of the actual requirements and needs which of the contents of Module 5 “Energy Evaluation” and cleaning are to be applied to the specific project. An individual co-ordinated offer will then be drawn up. The new Module 5, “Service and Maintenance”, developed in the framework of MountEE, is going to be tested on the building. The aim of the future Module 5 is to assist municipalities in the phases following the new building or rehabilitation phase. Support for the municipalities will ensure that the constructed or rehabilitated building also achieves the planned energy consumption calculated and forecast during the consultation phase. Another goal of the module 5 is to reduce the harmful substances in interiors. The aim is to perform the final building cleaning, the regular maintenance cleaning and the basic cleaning of buildings in such a way that the harmful substances in interiors are minimised. The actual cleaning tasks (i.e. maintaining value, improving surface appearance and observance of hygiene requirements) are of course also to be performed. Cleaning must also represent value for money for the Client. The need to provide assistance for buildings following the planning and construction phase is in particular a consequence of the ever more complex construction techniques and – especially in highly efficient buildings – of the increasing effects of user behaviour on energy consumption. The adjustment and parameterisation of the construction techniques will thus have a particularly significant influence on both the energy consumption and the comfort experienced in the building. During the commissioning of the technical systems, the focus is above all on the functioning and smooth operation of such systems. The extent to which the configurations of the technical systems actually correspond to consumption-optimised operation is however often not analysed or can frequently only be accurately determined once the periods of use and the user behaviour have been established. These can of course be assumed when planning and adjusting the parameters for the facilities, but this will not always correspond to the actual, highly individual conduct of users. It thus often only possible to establish optimum operating parameters for the technical facilities that correspond to the calculations following completion of the building and after a certain user familiarisation period. Moreover, the energy consumption of solid buildings in the first year after completion is not representative, as considerable energy together with a high degree of air change is necessary to ensure the drying-out of the building. • Calculation of the settings, parameterisations and conditions of the actual location: summer and winter temperatures, air change, user behaviour, etc. Energy demands were recorded in January / February / May / June 2013. 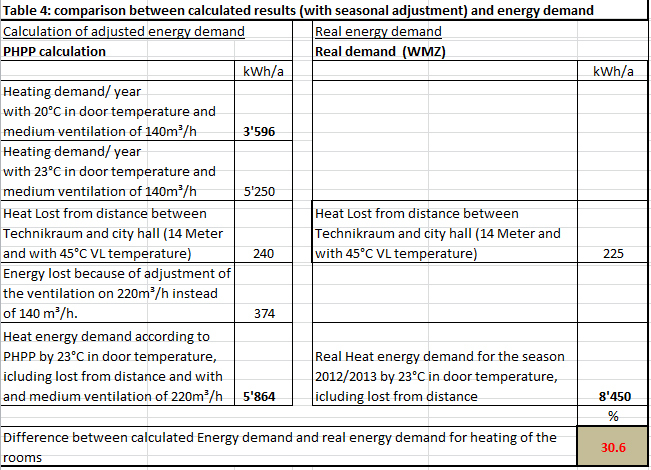 From July 2013 on, all energy demands were recorded once a month in an excel sheet (see table 1 below). 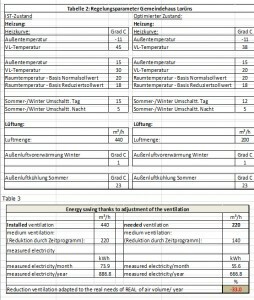 As basis for the energy evaluation the certified PHPP (passive) calculation system from 2012 is being used. 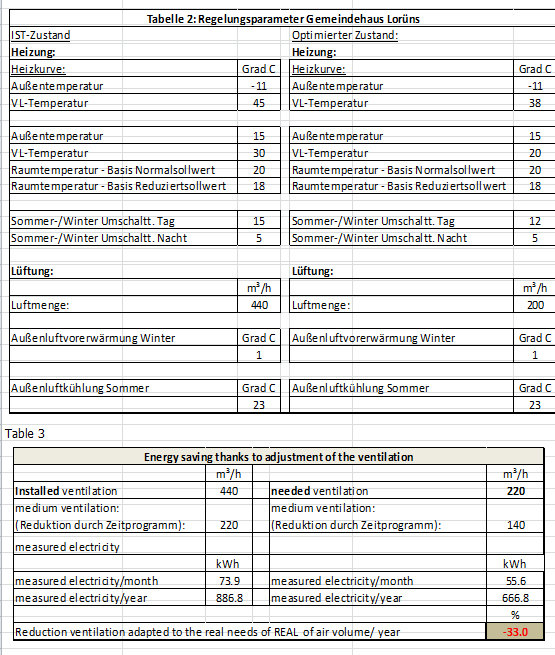 As it can be seen in table 2, control parameters for heating and ventilation are not adjusted to the passive house standard. For the heating of the rooms, a heating power of 14.5 Watt/m² would be necessary according to PHPP. With the adjusted parameters up to 45 Watts/m2 are possible. The air quality measurement confirmed that the amount of air was adjusted too high. The average air quality level was at 650 ppm instead of the required 1,000 to 1,200 ppm, showing that the ventilation was too high. By reducing the amount of air ventilation, the electricity demand could be reduced by 32.9% (see table 3). In addition by reducing the amount of air ventilation, the indoor humidity will be increased in winter, which will improve the indoor environment. Error analysis – comparison of current settings of measurement and control parameters with calculations, dimensions, etc. Readjustment of the parameters of the measurement and control devices, that are not user-specific (not depending on user behavior) but rather depending on default values. Done (possibly) together with the measurement and control device company and the person who supervises the facility management services of the building. Evaluation after the heating season. A calculation of the total efficiency of the heat pump (year performance) is not possible with the meter currently installed, because the electricity meter for the additional energy demand of secondary needs (primary and secondary groundwater pumps) are missing, which is non-negligible and can lead to an incorrect interpretation. • For the evaluation of energy from the water heat pump, a water meter after the groundwater pump is necessary. • An electricity meter for the measurement of energy demand of the server room is missing. • For the measurement of the energy demand for lighting, an electricity meter would be needed as well. There is not much potential for optimization of lighting in the city hall (already efficient), but the energy demand for a benchmark analysis would very interesting and useful. • If necessary electricity meter for lighting, however this can be difficult because of cost feasibility. • Electricity meter for groundwater pump (primary and secondary) as well as coverage of the separate condenser pump. The power demand of these pumps must be recorded separately, because groundwater pumping is also used for cooling or heating the air from outside in the ventilation system. With the engine hour meters in the DDC (direct digital control), the energy demand can be attributed to the respective system status. 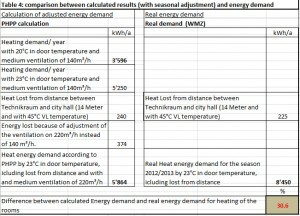 Through the adjustment of the control parameters to the building and the users, (see table 2), energy costs as well as heating demand will be reduce. By reducing the amount of air, the comfort will improve and the continuous costs for filter replacement will be reduced. Why do we want to optimize the cleaning? Examples show that the use of chemicals in cleaning can be reduced by 75% through the use of appropriate measures. Water requirements too can be reduced by 20%. Cleaning chemicals should in principle only be used where this is actually necessary. Cleaning should as far as possible be performed using fibre technologies. If chemical products are (or must be) used, the products must comply with the requirements of the Austrian Ecolabel or the European Ecolabel. Reducing the chemicals used in cleaning also makes matters simpler for cleaning staff. Exposure of staff to chemicals can in particular be considerably reduced. Optimised cleaning operations should form part of the pre-planning and planning phases of building projects: surfaces that are difficult to clean or can only be cleaned using chemicals are to be avoided, while appropriate cleaning rooms should be provided to ensure efficient cleaning. • Comments on the materials list (surfaces) provided by the architect as regards the following aspects: how often must the surfaces be cleaned, how chemical-intensive must cleaning be and what is the expected service life of the building products. There were no formulated principles of cleaning “vision” in the architectural competition – for future construction projects, this would certainly be an advantage. 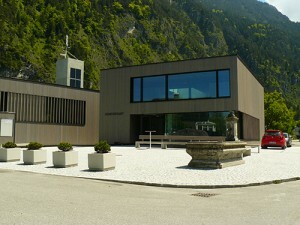 For example concerning the city hall of Lorüns, it would have been helpfull in order to find an optimized solution for the exterior window cleaning. The definition of the materials chosen by the architect allowed an efficient and environmentally friendly cleaning. Here there was a clear commitment of political deciders for a sustainable cleaning during the building construction works. Cleaning without chemicals was accepted by all project participants and formulated accordingly in the tenders. With the aim of energy saving without sacrificing comfort through energy monitoring and evaluation, follow-ups of heating, cooling, ventilation, plumbing, electrical systems etc. are important and necessary. Only with systems correctly adjusted to the building – and user-specifics- such as MRS parameters – apart from properly calculated, dimensioned, hydraulically balanced systems, buildings can be really efficient. The test of module 5 on the two buildings confirmed that a follow-up and an energy monitoring is as important as an energy-efficient building technical concept. In two information events within the project MountEE on November 5th and 6th 2013 involving key players such as mayors, energy representatives of the Vorarlberg state government or staff municipalities, architects and planners, an intermediate presentation of the module 5 has been presented. The fact that huge energy savings without sacrificing comfort is possible, impressed the audience and even the representatives of the Vorarlberg state government expressed their interest of energy monitoring for the newly built National Museum and further state buildings. Results show that energy monitoring saves energy by adjusting the needs and detecting the mistakes. In the future, do we therefore need only a few additional meters being installed, a competent person to evaluate the parameters and to make adjustments according to building and user-specific properties? During the evaluations in both studied buildings and from our experience, we noticed that the control of heating, ventilation, cooling technology, electronic equipment…) only rarely communicates with the control of the electrical maintenance group. For example, sun-blind controls are not regulated as a function of the season, but only with light sensors installed outside. The indoor temperature is not a factor and therefore sun-blinds stay open in winter in order to take advantage of the solar gain in the winter for indoor heating. Often, individual rooms are controlled by KNX / EIB, which do not communicate with the control of HVAV. Therefore we noticed that sometimes the temperature of the rooms is sufficient but not communicated to the pre-programming, so they continue to be heated. This is the case especially in spring and autumn (transition periods). Cooling is often considered too little in the planning or not at all. Thus, the buildings require little energy in winter, but in summer they are at the limit of comfort. IT server rooms are sometimes located in south-facing rooms, sometimes without natural ventilation options and thus are facing elevated temperatures and inefficient operating conditions and high energy needs for cooling. Thermal simulations of such critical rooms are rarely expected or mandated and we can often see too large planned fixed glazing compared to the windows: natural cooling/ventilation is not possible. Therefore, for a building, where the desired thermal comfort with the lowest energy demand can be possible, the whole project team (from builder, planner, to facility manager) must consistently take advantage of the planning phase and work together on theses aspects. Experts on energy monitoring and energy optimization should be involved from the very beginning of the planning/concept and must at the same time develop a measurement concept. A right measurement is difficult. There is few literature about this topic. A source for building management is the “Protokollband Nr. 45 Arbeitskreis kostengünstige Passivhäuser Phase V – Richtig messen in Energiesparhäuser” of the Passivhausinstitut Darmstadt. In this book are described which meters are necessary. They distinguish between the different heat sources systems such as heat pumps, gas water heater, etc. In practice, there are often differences of opinions. For example at the city hall Lorüns where the heat meter for heat generation was located after the heat generation by the buffer reservoir, metering the heat after losses due to the reservoir, and so the calculation of the heat was not correct. That’s why it is important to establish a monitoring concept in the early phase of the building planning and assesse it with an independent organization.